Friday afternoon for lunch I decided to check out this interesting new food truck in the Glebe area of Ottawa. I ventured down for an early 11:30 A.M. lunch of pancakes at Flapjack's Pancake Shack (809 Bank Street, Ottawa) which is located in a courtyard behind Mrs. Tiggy Winkles on Bank Street. The most interesting part is the location. 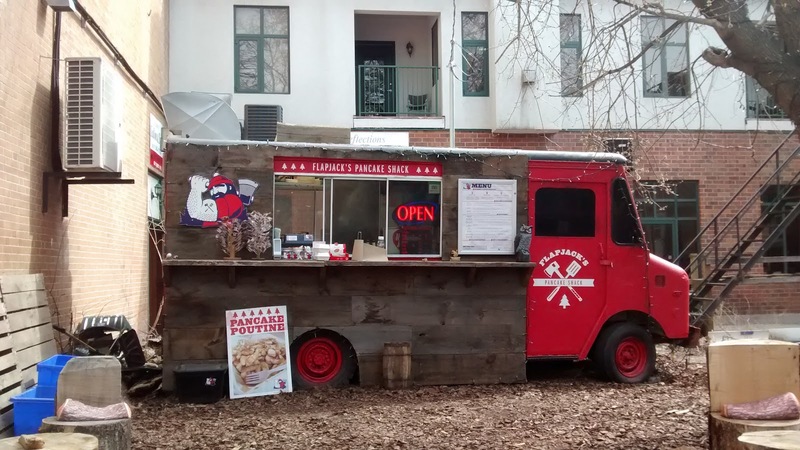 Located in a scenic courtyard off the main street, this food truck is a hidden treasure which most people walking by would be sure to miss. But a presence on Urbanspoon.com, Yelp, Twitter, Facebook plus a word of mouth recommendations by loyal local customers has helped put this food truck on Ottawa's food map. I arrived shortly after the 11:30 a.m. to the easy to find directions of the address and "behind Mrs. Tiggy Winkles" found on Urbanspoon and Flapjack's website to find a maple syrup bush meet city looking setting in the courtyard. Only two other ladies were sitting at the picnic table waiting for their pancakes to be made. I walked up, perused the menu located on the right hand side of the window and ordered. The Order: 1 order of Blueberry pancakes. I sat down at the picnic table next to the two ladies who were enjoying a game of Crokinole. Not a bad way to pass the time while your pancakes are being made. Another gentlemen joined us after ordering his pancakes and we shared giggles as the two ladies played. They were totaling up their points as the stacks of pancakes began to emanate from the truck window. I received my pancakes in a Styrofoam container and rejoined my new found pancake companions at the lone picnic table. I opened up my container to find a small condiment sized plastic container with maple syrup. Looked an attempt to skimp on the maple syrup by not allowing customers to pour it themselves. The regular size of pancakes comes in a quantity of four all stacked one on top of each other. The blueberries were quite noticeable. Instead of a blueberry juice purple colour stained pancake I had at Bramasole diner, there were actually blueberries embedded inside the pancake. The pancakes themselves were perfectly made. The syrup was just the right amount to satisfy my needs for pancake to syrup quotient. But others may have to beg at the counter for more. Overall, Flapjack's Pancake Shack is quickly becoming one of the things Ottawa's Foodie Scene is becoming known for. Like nearby Kettleman's bagels, Flapjacks has perfected a product, invested in ambiance and provide a quality product. Flapjack's is becoming a can't be missed spot for locals, friends and family visiting.